Summary: The InuYasha crew are stuck in Kagome's time and forced to go to school...little do they know another half demon is there. Summary: kagome has to move from her child hood home and leave her only friend behind, but whet happens whenshe moves back with no memories before her sixth birthday. 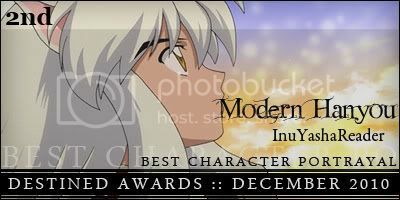 Summary: Witnessing InuYasha's heartbreak following Kikyou's death proves to be more than Kagome can bear and causes her to take drastic action. Summary: Time was supposed to heal all wounds, but in her case it did not. Perhaps an old friend could. Summary: He devoted himself to her recovery, hoping to steal her heart, when it all came crashing down. Will his wounded pride get in the way of retrieving her? When Kagome is severly wounded in the final showdown with Naraku. Inuyasha tries to get her to go home to her own time to heal. But when he accidently reveals that he is going to search for Kikyo, A heartbroken Kagome leaves, With strict Instructions for Inuyasha not to come after her. But when the well Seals, Trapping Kagome in her time and Inuyasha in his. The two realize that they will not be able to live without each other. What will happen when Kagome and Inuyasha are finally reunited, will she hear him out or will her stubborness get in the way? Summary: Kagome comes across an injured woman that later turns out to be a Princess of an unknown place. Her death triggers a path that she now must walk... but why is Sesshoumaru involved and what is his crazy aunt hiding? Disclaimer : I do not own Inuyasha Characters,of course. I even cant draw them. They are Rumiko Takahashi's. One year after The Shikon Jewel found, Kagome went back to her normal life with her memory of Inuyasha with her. 'Noooooooo! Kagomee........, don't go.............. I still need you, Kagome..............’ Inuyasha wanted to grab Kagome's hand but the gate brought Kagome to her time and it was closed. The well backed to be the normal well. Random one-shot. A Christmas Eve tragedy for the Higarashi family. Just what exactly is that tragedy though? Read to find out.